New York black metal band Yellow Eyes has released a steady stream of material since 2012, but with most only available in extremely limited numbers you may not have come across them before. Sick With Bloom, their third full length and first for Gilead Media, is likely to change that and is the perfect record to serve as the soundtrack for the colder weather that is beginning to sweep across the United States. Filled with sweeping melodies that expand naturally over the course of each song and abrasive blasting, Yellow Eyes’ latest release may be reminiscent of the path some of the other U.S. black metal bands have taken in recent years but they are able to put enough of their own spin on it to remain a distinguishable entity. From beginning to end Sick With Bloom has a consistent flow between songs, with various field recordings from the Connecticut wilderness where the album was recorded used as a way to tie them all together. 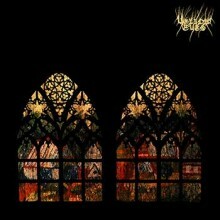 But whether you choose to take in this material as a cohesive body of work or on a track by track basis, there are a lot of moments that are truly breathtaking and demonstrate Yellow Eyes’ ability to merge the abrasive elements of black metal with sweeping instrumentation that has a warm yet somber feel. At times the urgency present on some of the songs is reminiscent of other American black metal bands like Krallice with a similarly dense and fast paced approach to the genre, but he difference here is that this group doesn’t keep their foot on the gas the entire time. Instead, they alternate between colder blasts and mid-tempo sections that ease away from the usual fierceness and let the melodies take on a more expansive and warmer feel. It’s the type of metal that allows the listener to form a narrative in their head as they listen and let both the warmer and aggressive tonality overtake them completely. Listeners will also find that the shifts between tempos and regular twists and turns that shy away from the lengthy post rock style build-ups that can be typical for this type of black metal helps make Yellow Eyes feel different than the norm. Admittedly by the end of Sick With Bloom some of the riffing does blur together a bit and the earlier pieces do seem to stick out just a bit more, but even as elements start to sound a bit similar the band remains engaging thanks to their slight deviations and sweeping melodies that create vivid imagery in one’s head as they listen. The instrumental work on this release may regularly cross the line between abrasive and melancholic, but the vocals stick solely with harsh shrieks and screams. It’s the type of performance that consistently grabs your attention, as even when the guitar work has shifted over to drearier introspective melodies the high shrieks sound like they’re going right for your throat and cut through the layers of instrumentation with ease. Despite the fact that the screaming and shrieking stays at around the same general pitch for the majority of Sick With Bloom, Yellow Eyes is able to avoid falling into repetition by incorporating quite a few extended instrumental sections into each song, making each reappearance of the harsher ranges shock the listener back to attention and keeping the intensity at its highest possible level. Whereas so many others feel the need to incorporate clean singing or other sound clips into their performance this group keeps it simple and allows a singular vocal range to take over and guide the songs towards their peak levels. Some of the blasting sections may blend together a bit by the end, but that doesn’t dull the impact of Yellow Eyes’ latest full length. The band has delivered an entrancing combination of expansive melodies that have a cold yet inviting feel and harsh edges that deliver a shock to the system, and these elements are merged together in a way that’s reminiscent of a number of other U.S. black metal groups without ever falling too close to any particular one. It’s another noteworthy black metal release from Gilead Media, who has had a stellar 2015 release schedule, and should help to put Yellow Eyes on the map for quite a few listeners.